What does a good pastor look like? That’s a question I’ve thought a great deal about over the years—both for myself and now for those who I’m helping to train for pastoral ministry. While pastors come in a variety of shapes and sizes, I’m convinced there are six essential characteristics that help make a pastor both faithful and fruitful in ministry. They say a picture is worth a thousand words. 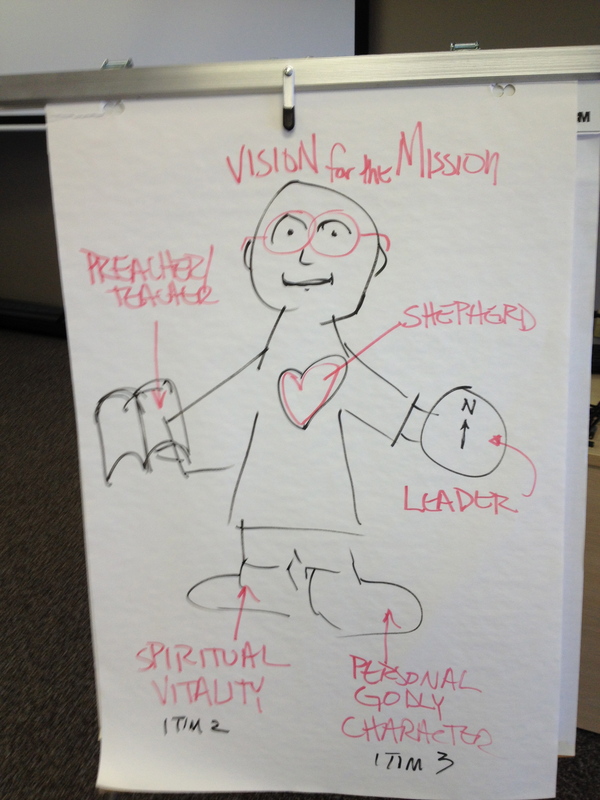 So during a course I was teaching on the Pastoral Epistles (1 & 2 Timothy, Titus), I drew a sketch of the “ideal pastor.” My drawing won’t win any art awards, but it does help me remember six characteristics all pastors need to develop. A pastor needs a solid foundation for life and ministry. This firm footing comes from having both spiritual vitality and godly character. Spiritual Vitality: Dr. Howard Hendricks used to tell us, “You cannot impart what you do not possess.” If a pastor doesn’t have a genuine, growing spiritual life, he won’t be able to pass it on to others. In my drawing, the hands and heart of a pastor represent the three main ways a pastor serves the congregation: shepherding, preaching and leading. Shepherding: The Greek word for pastor literally means “shepherd.” So it’s not surprising that the heart of pastoral ministry involves carrying out Jesus’ command to Peter: “Take care of my sheep” (John 21:16). Good pastors spend time with the people they serve; good shepherds smell like sheep! Preaching: One of the primary ways a pastor shepherds people is by feeding them God’s Word. No wonder Paul called Timothy to “Preach the Word” (2 Timothy 4:2). Godly pastors are willing to work hard–week in and week out–preparing healthy meals from God’s Word. Leading: Shepherds not only feed their sheep, they lead their sheep. They don’t drive them harshly but direct them wisely. Faithful pastors understand that Christ Jesus has given His Church a mission to accomplish in this world. So they seek to keep the congregation on mission. So far we’ve looked at the feet, hands and heart of a pastor. Now we come to the eyes–a pastor’s vision. Vision for the Mission: Pastors can’t be content with simply caring for those who are presently part of the church. They need to lead the congregation to reach those outside the church–the lost sheep that Jesus died to save (John 10:16). A pastor’s vision must be both near-sighted (local) and far-sighted (global). By their example and instruction, pastors must seek to prompt their congregations to reach neighbourhoods and nations with the good news of the gospel. While no pastor will be perfect when it comes to embodying these six characteristics, all pastors should seek to make progress in each area. As Paul told Timothy: “Be diligent in these matters; give yourself wholly to them, so that everyone may see your progress” (1 Timothy 4:15). Take a few minutes and pray for your pastor. Pray as well for those we are training at Heritage to be the next pastors of the church. That’s a wonderful portrait of a well rounded pastor! Thanks Dr. Reed.